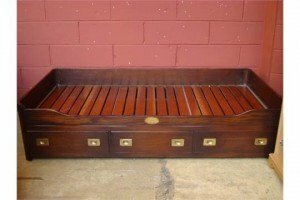 A hardwood ships style cabin bed, with raised sides above a base with three drawers with sunken brass handles, brass carrying handles to sides. 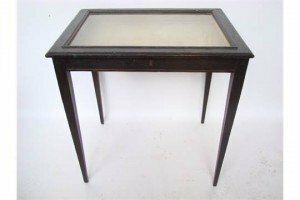 A 19th Century ebonized oak bijouterie table, the hinged glazed rectangular top opening to reveal a velvet lined interior raised on square tapering supports with lever lock and key. A late 19th century archaeological revival lava ram and cameo pendant. Comprising three black lava cameo busts, with phial and frog spacers, suspended from a black lava cameo Medusa, to the black lava rams mask surmount. A late 19th century gold photograph pendant. 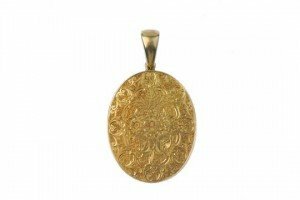 The oval-shape floral and foliate engraved pendant, with later photograph depicting a gentleman in early 20th century period dress. 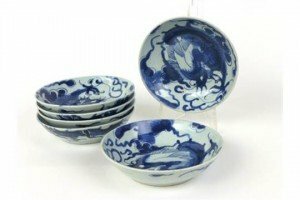 A set of six late 17th/early 18th century Chinese dishes, each decorated internally and externally with a dragon amidst clouds on a pale ground. 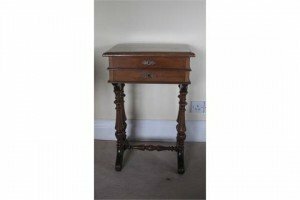 An early 19th Century mahogany side table with two frieze drawers on slender tapering supports. 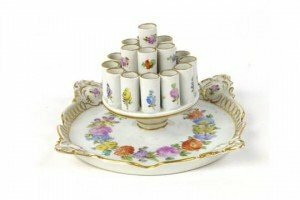 A late 19th/early 20th century porcelain cigarette holder decorated with flowering shrubs within a gilt border, bearing Dresden marks. 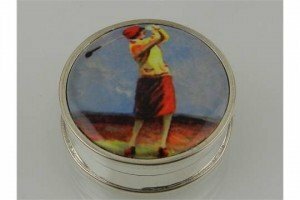 A novelty white metal circular pill box, the lid inset with an enamel plaque depicting a golfer. 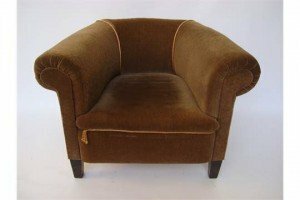 An early 20th Century tub shaped armchair, on square tapering forelegs, upholstered in brown velour. 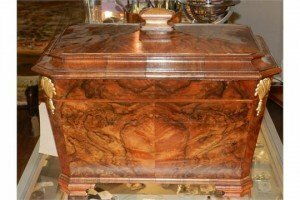 An early 19th century figured walnut wine cooler, of sarcophagus form, parcel gilded and feather banded, having a hinged top enclosing a lined interior above a tapered body with chamfered corners, decorated with bell flowers, raised on ogee bracket feet. 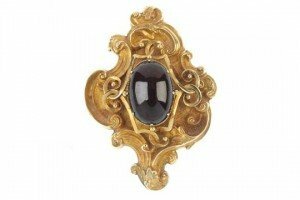 A late Victorian gold brooch. The central oval-shape citrine with star set with split pearl to its centre, to the scrolling surround. 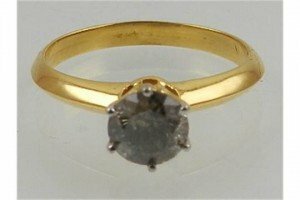 An 18 carat yellow gold and solitaire diamond ring, the fancy coloured stone of approx. 0.70 carats. 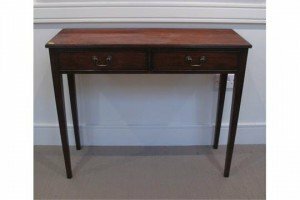 A 19th Century walnut rectangular occasional work table, fitted interior above frieze drawer on turned supports and scroll feet. 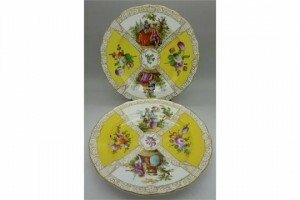 A pair of Dresden plates decorated with panels of figures and flowers within a yellow ground. 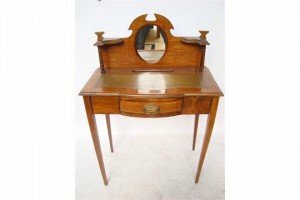 An Edwardian mahogany bonheur du jour, satinwood cross banded, the raised back with central oval mirror, the top inset with gilt tooled writing surface above a bow fronted frieze drawer on square tapering legs. 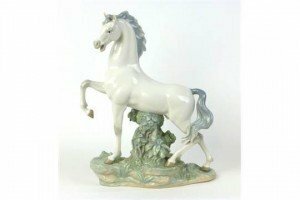 A Lladro figure modelled as a prancing horse upon a naturalistic base. 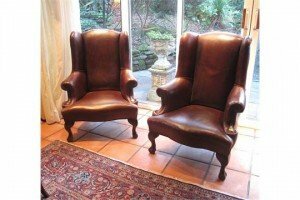 A pair of leather upholstered small wing back armchairs by Arthur Brett raised on cabriole supports. 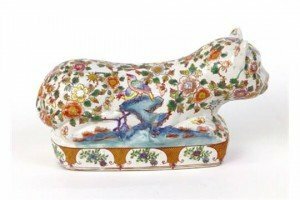 A 20th century Chinese ceramic figure modelled as a seated cat resting on a plinth, decorated with flowering shrubs and birds on a plain ground. 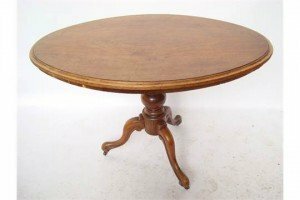 A Victorian walnut oval table with tilt action, on baluster turned stem and cabriole tripod base, on brass casters. 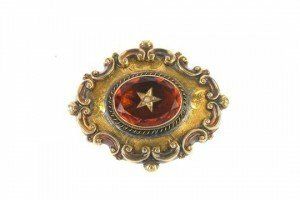 A late 19th century gold and garnet pendant. 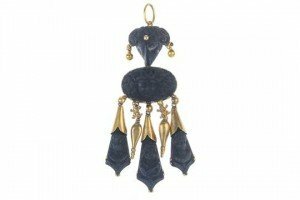 The oval cabochon garnet claw set to the wirework and scrolling surround to the reverse glazed panel with woven hair and gold-tone thread and surmount loop.